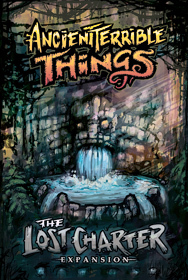 Ancient Terrible Things: The Lost Charter is an expansion for the pulp horror dice game, Ancient Terrible Things. This box includes 57 unique cards, including new Achievements, Swag, Feats, Encounters, Character Obsessions, plus 3 Revelation dice and a 5th Character mat and pawn. Also included are Travel edition Location cards and dice platform, to play the original game as a compact travel friendly edition Rulebook includes new rules for 5 player and solo play. The errata of v1 was corrected in the new rule book. The player mats are different and that's basically it. The new rule book is available online, so you can download it and play a v1 game.